Life’s wonder and mystery can only be discovered where you are. The awakening spirit becomes empowered through surrender. Rather than trying to force life to meet their perception of perfection, they seek to see the perfection in life as it is. As human beings, our view is narrow – typically focused on ego-driven desire and based upon our immediate life experience. We cannot see the threads of life as they are woven together to create the tapestry of creation. The hand of the Divine is always at work in ways that we cannot imagine with our limited perception. And yet, often there is an aspect to our belief system that prompts us to attempt to control, plan for every contingency or need assurance prior to taking action. 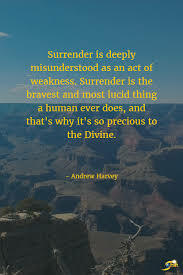 Spiritual mastery involves conscious surrender to what is. As you cultivate worthiness and self-esteem, it becomes less important to be seen as right. Inner humility guides us. Love becomes the expression of our joy and what you need to know will make itself known at the perfect time. Today my intention is to act with integrity, do my best and accept what is.